I realize there’s very little point in my little blog reviewing a Pulitzer Prize winner three years after the fact. 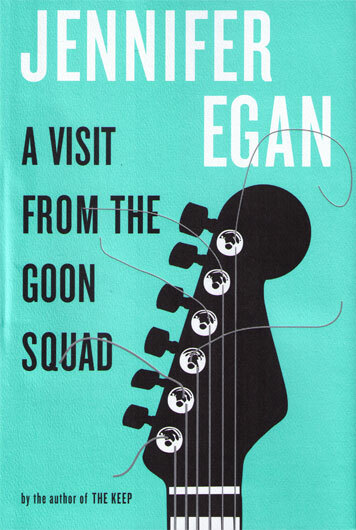 But I can’t help the urge to tell the three people left who somehow haven’t heard about Jennifer Egan’s A Visit from the Goon Squad but might be inclined to read it: DO THAT RIGHT AWAY. There’s something distinctly cool about this book. For starters, it’s cool. It’s rock and roll. It’s about the music business, and it’s about music. It sprawls through several decades, centered on New York City but willing to move to Naples or the Southwest when necessary. It meanders through the minds of music executives, their assistants, fans, amateurs, professionals, kids and adults, the past, present, and a very scary/realistic near future. At times, it is about the music, man, in that very nostalgic, Almost Famous way. There’s a particularly wonderful chapter near the end that makes rock-song pauses into both a science and a beautiful metaphor. But it’s mostly about the tragedy of impermanence, of time passing, which, if you think about it, is what a great song makes us feel: Why must it end? Why can’t it go on forever? When my boyfriend saw me reading this book the other night, he said, “What’s that about?” At first my answer was, “I don’t know. Just … people.” I then reverted to reading him the back copy, which said something about following the adventures of an aging music executive and his kleptomaniac assistant, etc. That’s accurate, but my first answer was closer. That story about pauses? That story that’s really a POWERPOINT PRESENTATION? Yeah, that’s the story that has me weeping every time. The amazing thing is that the form came first for Egan. She just knew she wanted to write a story as a PowerPoint presentation and figured out exactly what story to tell through the process of working in the form. Yes! I know! So amazing.